So I hung out with my friend Lindsay from the States today (September 24, I'm a little behind) she had some issues with the boyfriend so we went and did some retail therapy. I left her after we did some shopping on Oxford St. As I was walking home from the tube station I was thinking about how I wasn't in the greatest of moods either. Just things weren't going well and smoothly. 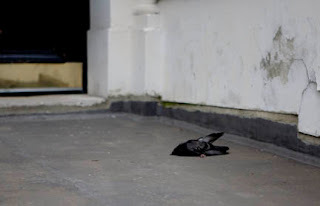 Then I am like to houses away from mine and I see a dead pigeon in front of a door of another house. I pass it a few steps and am like well I should photograph it to illustrate how I was feeling and probably Lindsay as well. So I get out my camera and back track a few steps and I frame up the shot, not a very artistic one but you know. As I am looking through my view finder the pigeon kind of raises its head a little. I was like "Oh, geez it isn't dead." I shot a few more frames while it made a few other head movements. I felt horrible, I didn't know what to do, if there was anyone to call. But it was a horribly perfect end to a horrible day, I continued home almost in tears.